Senate President Bukola Saraki, after a meeting with the leadership of JOHESU on Thursday, where he listened to their grievances and demands, yesterday, met with the Minister of Health, Prof. Isaac Adewole and the Minister of Labour, Dr. Chris Ngige, to hear their own side of the issue. 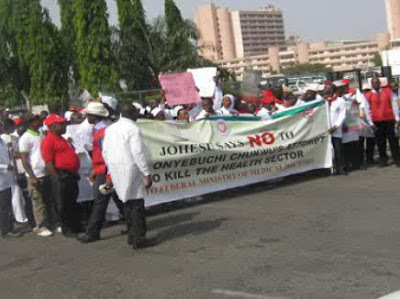 While meeting with the JOHESU leadership led by its Chairman, Biobelemonye Joseph, the President of the Senate, had pledged that the Senate would ensure that the right thing is done to end the strike.Chief Press Secretary to the President of the Senate, Sanni Onogu, in a statement in Abuja, said Saraki’s meeting with Adewole and Ngige was meant to hear their side of the issue and to forge a way forward, not only to end the strike, but to ensure that there is lasting peace and industrial harmony in the nation’s health institutions. During his meeting with the leadership of JOHESU, Saraki said the Senate and, indeed, the National Assembly would ensure that the right thing is done to end the strike.He noted that it is not in the interest of the country to have its hospitals closed while he pledged that the Senate would work with all stakeholders to ensure that the strike is called off. Saraki said: “Our interest here in the Senate and the National Assembly in general, is to find a solution to this problem. It is not in the interest of the country for us to have our hospitals closed and we must work to ensure they are reopened promptly.“I have heard your remarks, I will spend some time to discuss with you and get more details to see how we can put an end to this strike. “On our own part, we will bring all parties involved together to ensure that where commitments have been made, those who made the commitments honour them.“The only thing I can assure you is that we will make sure that the right thing is done and that this matter is resolved,” he said. Meanwhile, the National Association of Nigerian Students (NANS) has issued a 10-day ultimatum to the Federal Government to resolve the ongoing strike action by the Joint Health Sector Union (JOHSU).Speaking at a press conference yesterday in Abuja, NANS President, Aruna Kadiri, also pleaded with JOHESU to suspend its strike in the interest of millions of Nigerians and their families who were bearing the brunt of the action.